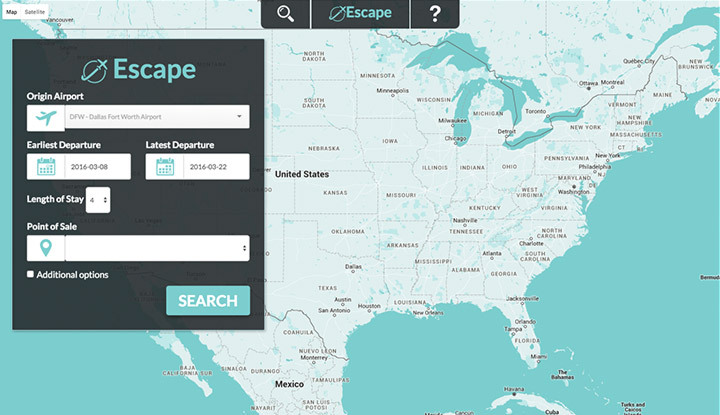 Escape is an inspirational air shopping application that uses a combination of search and intelligent APIs in a simple workflow. Travel agents or end consumers can easily use the flexible search capabilities provided by this application to explore potential trips based on budget, theme and region. The ability to search by mileage is also an interesting application, as it allows frequent fliers to search for the routes that provide the highest “miles earned” for their specific loyalties. This advantage extends beyond travel hackers to road warriors, allowing agents and travelers to quickly gauge elite-qualifying miles within a particular search.